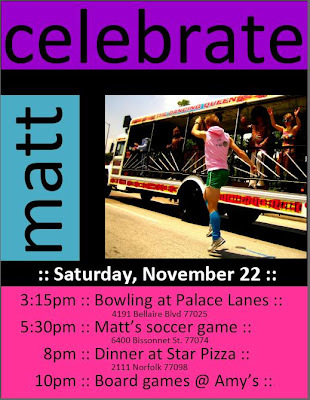 Matt's birthday is rapidly approaching. Buy a shirt for the "I love my bloodhound" applique (luckily the applique is already cut out of vinyl--see photo below). Sew on the applique, wrap the shirt, and write a card/agenda for the day. Send out a reminder e-mail to the guests with all the logistics. Plan and make the appetizers (to be served at Matt's soccer game). Make signs for Matt's game. Make a reservation at the restaurant. Any ideas for appetizer/snacky food to be served picnic-style? Ideally, it will need to be served cold and require no utensils! I love skewers with a ball of mozzerella and a cherry tomatoe wrapped in a basil leaf. Yum! Speaking of Costco, I love the little mini quiches they sell there!